Aero Garden for starting seeds? My wife and I got an Aero Garden as a wedding gift. I'm a newbie at SFG and have never started from seeds. Today I saw a 70 pod tray for starting seeds in the Aero Garden at the local hydroponic grow store while I was buying my vermiculite. Has anyone one had any experience using an Aero Gardern? We started with 1 Aero Garden and now have 3! We use them to grow lettuce and other greens when it gets hot here in Dallas. We also grow a couple of tomatoes to keep us going when the tomatoes stop producing for 3-4 months here in the heat. I also use it to start my seeds indoors. Mine holds 66 seedlings. It works well for me. Re: Aero Garden for starting seeds? Jane, what do you do about replacement pots? Aero Garden sales 125 for $ 19.99. Have you found any other options? Wow! They have increased prices lately! I'm currently working off a backlog of sales and internet specials on plug replacements. I seem to remember Park Biodome replacements plugs are a good fit. I will be researching this again in the near future and will be replying back soon. The deal here is to get the correct Biodome replacement. The size matters. A very doable thing if you do not want to buy replacement sponges from Aerogarden! You get a set of starters with the kit from Aerogarden. It is the replacement plugs where the rub may be. I found out that Park Seed sells plugs for their Bio-dome that will fit the Aero Garden seed starter block. $ 11.95 for 120 as compared to Aero Garden's 19.95 for 125. Bingo! That's it! (I must do better with my bookmarks ). What I do with my plugs is soak them in a pan of water for about 30 minutes. I then put my seed(s) in the dibble (indent or hole in the top) and then put the plug in the foam Starter hole. Key here is for the plug to be long enough to touch water. I was given one of these for my birthday last year and the herbs kit with it has done sterling service for 4 months (although one seed type failed to germinate). I have a seed starter kit and plan on starting some veg and flowering plants. Does anyone have advice for me? Anything to avoid? Are the plants a bit quicker off the mark in this set-up? Can the packet information be relied on when staggering planting times? 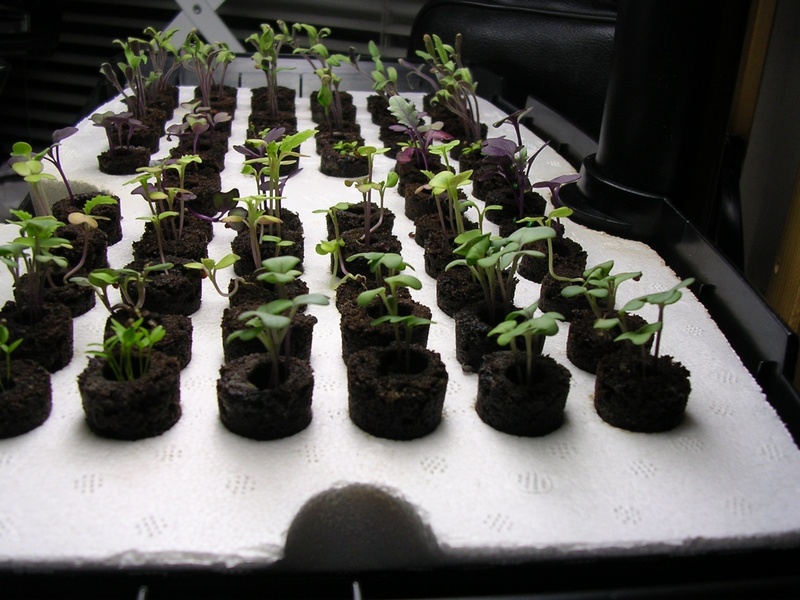 The herbs seemed to zoom into growth and there is not much point me having a tray full of seedlings ready for planting out in April! Aerogarden 2nd try at starting seeds! I'm also trying to use my aerogarden to start seeds but I'm having a few issues. One of them is that the after you drop the seeds down into the little hole, I can't figure out how to cover them. The "soil" that is in these tiny pots doesn't seem to want to move and is very spongy. I bought 2 of these kits and one of them totally failed. I am now trying to do this all over again and am having a heck of a time covering the seeds. Any suggestions? Also, thank you for the photo of your seeds growing. My pods seemed to sink to the middle or the bottom of the tray when I tried them the first time. This time, I soaked the pods in water a little before I put them back in the tray just to try and get them to stay up on top. How did you get yours to be almost 1" off the tray? Thanks in advance! 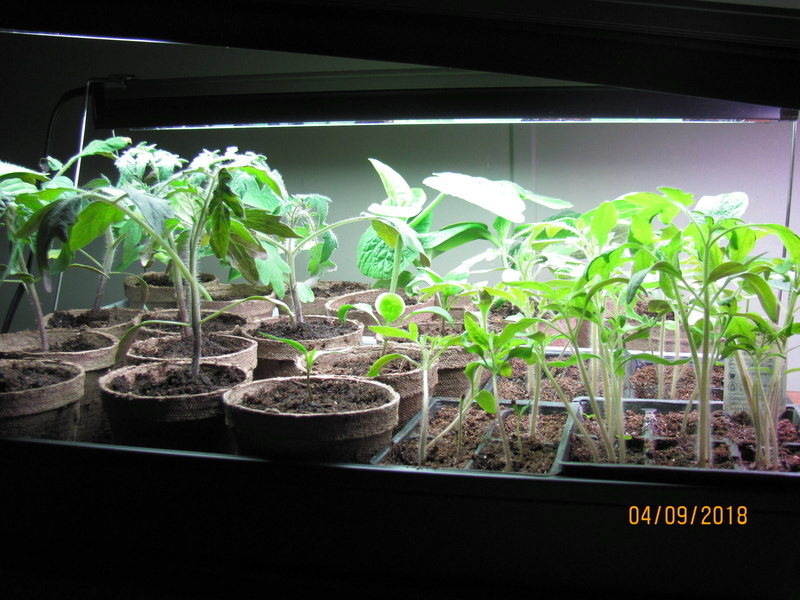 I think that picture is of cheaper plugs from a different system which are being used in an aerogarden. Mine came in the official kit and are all below the surface of the polystyrene. I don't think that you need to cover the seed unless it is seed which dislikes light. My broccoli and kale seeds have germinated very fast indeed and now have seed leaves. The only problem I have so far is with some sage seeds which went almost instantly mouldy. And lots of others have not germinated yet but only a week since I sowed them. Broccoli on the right, kale on left and basil left of centre. Most of the rest are flowers and some are just germinating but have no leaves yet. Now I am worried! I wonder if having the plug surface too low encourages mould because there is not enough air circulation around down there? Added: OK. I lifted out the white tray and then (wearing disposable gloves) I pushed each sponge up a bit until its top was flush with or above the white surface. Hope that prevents any problems. I don't understand why the instructions don't include this if it can be a problem? Added 2: It says here http://www.aerogarden.com/aerogarden-customer-service-support/lthereisgreenstuffonthetopofthegrowsponges.html that the mould should not prevent germination and should go once the plant grows a bit. So perhaps the mould is not related to poor germination? I am fairly happy with my results. I lifted the larger plants out when it seemed the right time (right to me). The kale and broccoli didn't quite get enough out of the liquid fertilizer and were a bit too pale but perked-up once potted. Some seeds are still germinating (6 weeks after sowing) and the only total fail is a packet of quite expensive trailing petunia seeds which were sold as coated pellets - not a single one has germinated. This is fantastic! I had been contemplating selling my AeroGarden as I no longer have the most convenient place for it, but it occurred to me that I could start seeds in it. I just set an old cardboard egg carton + vermiculite on the tray - the bowl and it seems to be working well. I'll remember this jiffy tray the next time I start seeds. I started two kinds of tomatoes in my Aerogarden and one kind in a seed starting medium (not MM) on the same day. "Someone" (11 year old) thought that she should help out and moved the plugs around in the Aerogarden so I don't know which is which of those. 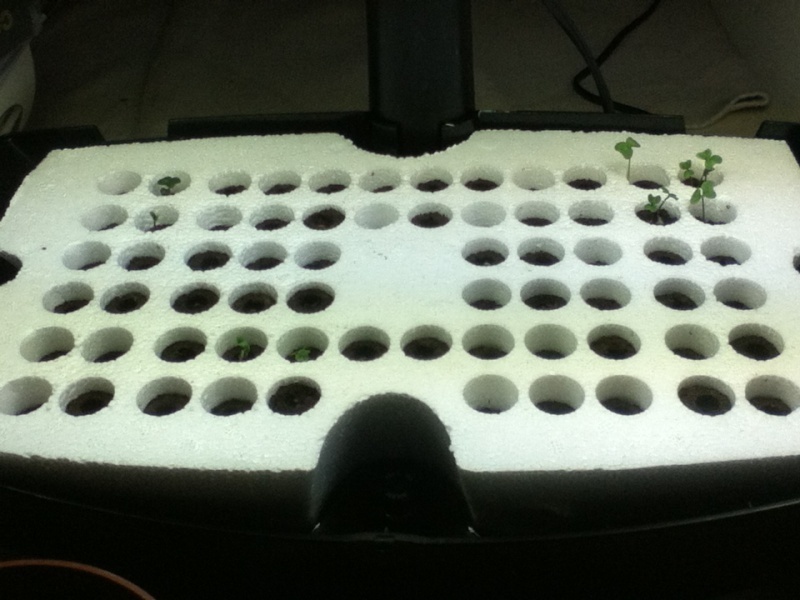 The seed starting tray was all Rutgers and the Aerogarden was 2 Rutgers and 4 Moonglow. I had to pot up the Aerogarden plants on Saturday. Here they are, side by side, 23 days after planting. The Aerogarden has the LED lights and the light above them both now is a T5 from Ferry-Morse that I picked up at WallyWorld. I used the liquid fertilizer for the Aerogarden on both. Your starts look so nice. Thank you Sanderson. You can see some peppers between the tomatoes as well. Thank you! Been using two units for seed starting: an early 7-pod Aerogarden (flourescent) for 3-4 yrs, and another (7-pod LED) for a couple of years. Both work well, although the newer LED seems to work somewhat better.